How to Solve Nokia N91 Charging Problem ? Mobile phones are electric device and no one could guarantee you that will not face any problem. But we have to buy good ones. 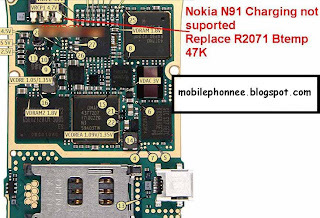 Nokia N91 mobile phone useres are facing a common problem with Nokia N91 Not Chraging problems and it may causes that battery damage or may displayed charger not supported. 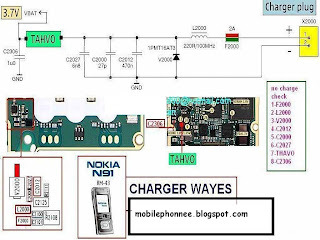 Well, I have found a tutorial about how to fix Nokia N91 Not Charging Problem and I am giving you Schemetic Diagram Images, That shows you how to fix it. You need be an experienced to fix Schemetic Diagram Devices.I am not giving you 100% guarantee. But it works for my workers at mobile repairing shops.